The case of Trayvon Martin, a black teenager shot and killed Feb. 26 by a Neighborhood Watch volunteer in Sanford, Fla., has captured the nation’s attention. The shooter, George Zimmerman, claims self-defense and hasn’t been charged with a crime. “This guy looks like he’s up to no good, or on drugs or something,” Zimmerman told a 911 dispatcher, adding that Martin was wearing “a dark hoodie, like a gray hoodie.” Moments later, Zimmerman shot an unarmed Martin in the chest, and claimed it was in self-defense. 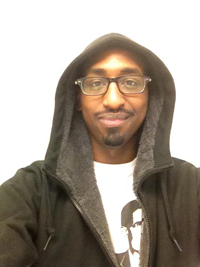 Daniel Maree, 24, started the Million Hoodies for Trayvon Martin rally and social media campaign. Federal authorities said Monday that they would take over* join the investigation. The announcement came on the same day that Daniel Maree, a 24-year-old digital strategist in New York City, wrote a blog post and uploaded a YouTube video, pushing for Zimmerman to be charged. Maree asked people to post photos of themselves wearing hoodies with the hashtag #millionhoodies, sign a petition calling for Zimmerman’s prosecution and for New Yorkers to march on Union Square Wednesday. The Million Hoodies for Trayvon Martin movement is now spreading to other cities, including D.C. (Disclosure: Maree used to be my neighbor and we’ve hung out a few times). The Martin case resonated with Maree on a number of levels. He grew up in South Africa where “as a black person you feel like you’re at home” since the country is majority-black, Maree said. 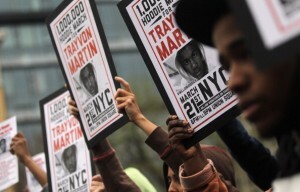 Supporters of Trayvon Martin rally in Union Square during a "Million Hoodie March" in Manhattan on March 21. Such sentiments have been articulated by many others in recent days, including in pieces published in The New York Times and GOOD, and in one that aired on MSNBC. The case has spurred a national conversation and people from around the world began posting hoodie photos Wednesday. Maree said some of the most powerful images have been photographs parents have taken of their young children in hoodies. Hundreds of people showed up for the New York rally Wednesday, including the Martin family. 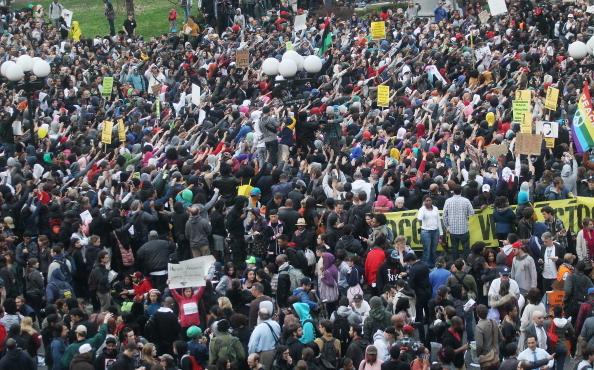 Another rally will take place on 2 p.m., Saturday at D.C.’s Freedom Plaza. In the past, similar social media movements have received criticism as being an easy way to feel involved — or slactivism. A few YouTube commenters have made similar criticisms of the million hoodies movement, which Maree rejects. “I don’t think standing in solidarity with people, in any way, shape or form is a small thing. It’s a very powerful message that you can send,” he said.